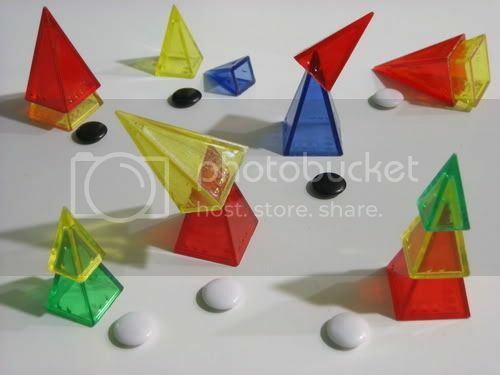 Zendo is an inductive game played with triangular pieces of a set called Rainbow Treehouse. Sadly, the Zendo boxed set was discontinued, and only the Treehouse pieces are still available. They are also very expensive: the set to the right costs somewhere between eight and twelve dollars, depending where you buy it, and you will need many of these to play Zendo. Since the pieces add a lot of complexity and clarity to Zendo, it seems hard to replace them as well. In a game of Zendo, the players (called students) must manipulate the pieces to produce arrangements (called koans), which are then judged by the moderator (called the master) on the basis of a secret rule he has fixed at the beginning of the game. Koans which follow the secret rule have the Buddha-nature (represented by a white stone placed near them by the master), and those which do not follow the secret rule do not have the Buddha-nature (represented by a black stone). The players must use these judgments to discover the secret rule. But in order to place a guess on the identity of the secret rule, they need to spend guessing stones, which are themselves gained by making successful "mondos," or guesses on whether a given arrangement will turn out valid or invalid. When all koans are made and the master is at your koan, you must call either "master," in which case the master will judge the koan, or "mondo," in which case every player must guess whether the koan will be judged valid or invalid by putting a white or black answering stone in their fist, waiting until all the players have done so, and then revealing their guess. The master then marks the koan as usual, and those who answered correctly get one guessing stone. After a player's master or mondo, one of his guessing stones may be spent to try to guess the secret rule, and a player may try to solve as many times as he has guessing stones. When a guess is incorrect, the master must provide a counter-example. These counter-examples are generally the most informational koans. An ongoing game of Zendo. As you may have already guessed, the theme of Zendo is Buddhism. The author sees some connection between Zendo and Zen thinking, although others may disagree. Either way, it is not the theme that makes this game so addictive. Games of Zendo are highly interactive and require dynamic thinking. It is a fluid process involving constant reconsideration of one's hypotheses on the basis of new information brought about by arrangements or the master's counter-examples. This game is often compared to Mastermind, because both involve using logic to uncover some secret rule or code. However, this is where Zendo's superiority really shows: in Zendo, inductive reasoning is used, not deductive reasoning. During the course of a game, players will have to use the same mental processes that are used to produce and test scientific theories, including induction, pattern recognition, falsification, evaluating probabilities, and more. Because of this, the depth of thinking required by Zendo is much greater than that of Mastermind. Since Zendo is already very interactive and the competitive aspect is pretty minimal, it shouldn't be very difficult to make it cooperative, or at least semi-cooperative. All one really needs to do is put the guessing stones into a common pool instead of giving them to one specific player, and balance this by making mondo guesses only applicable to the player calling for mondo. Another, simpler alternative is to eliminate mondo and guessing stones.